There is a rich history of Magic cards that are related to farming. Cards like Swords to Plowshares or Goblin Settler or even one of the original cards: Farmstead. In Born of the Gods there is Karametra, God of Harvests. 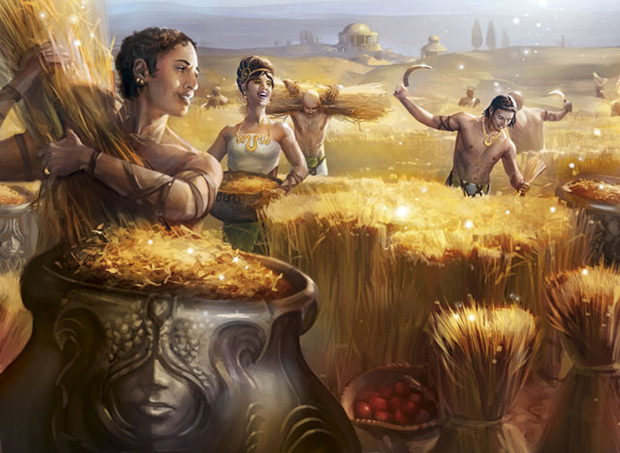 I looked at her art a few weeks ago, but today I wanted to highlight a fun nugget in another Born of the Gods card: Reap What Is Sown. If you look at the art you see Therans harvesting what appears to be grain, and if you look closely you can see the urn they are filling bears the face of the god of harvests herself, Karametra! Location: Bountiful fields of grain. Action: Show us a vast swath of grain that is being harvested by Setessan men. Their bronzed skin gleams in the sun as they swing their scythes and haul the grain. On the grain urn have the face of Karametra on it. They should all be idealized Adonises. If there's room and/or the composition works, show a Setessan female overlooking the workers. Focus: The bountiful harvest and the muscular men. Mood: Bountiful harvest and health blessed by the god.